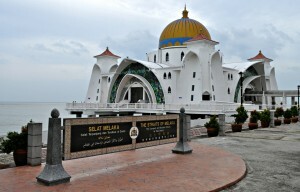 The Melaka straits and the mosque. As much as we enjoyed walking around the masjid, we were also a little concerned. Not for our safety or anything like that since we never felt, even once, concerned for our safety in Malaysia. The people are friendly, outgoing and are incredibly helpful to any tourist that needed assistance. There is a point of realizing that the fear we create is only that and nothing more. The fear of the other, the fear of being taken advantage of and the fear of seeing people for who they really are, instead of a stereotype or a simplified version of a group is deadening to humanity and the world. The more we see people as individuals, and treat them as such, the better the world will get along and the more we will all be able to deal with each other. I have noticed that Jill and I tend to have very disparate groups of friends. We often hang out with people in their young 20s, and get along great with them, and then hang out with people in their 50s or 60s and get along great with them. We are both interested in meeting the person inside and getting to know what makes them tick and how they view the world. This allows us to connect with people and find commonalities that others might miss. I used to be a psychotherapist/social worker back in the San Francisco bay area. I worked for 5 years with elderly clients dealing with any diagnosis ranging from simple depression to psychosis. I then moved to work with 18-24 year clients dealing with first or second episode psychosis. I was able to effectively work with all these clients, and their families, because I took them for who they are, doing the best they can with what they have, and then tried to support them with empathy and skills that I have learned that have helped not only others, but myself, in times of need. I didn’t look down on them because they were having difficulties. I was also honest in the issues that I saw and asked if I could give input. They almost always allowed me for it, and when they didn’t, I wouldn’t give it until they asked for it later. In this case, I am giving an unasked opinion of a concern I have that became very evident when we walked to the Masjid Selat Malaka and back to our apartment. Most of the buildings around it are desolate and decaying. This may not be a sign of much but it seems as if they were all built within the last 5-10 years and yet none of them are occupied. It is like walking into a ghost town and one gets the feeling this would be what a town feels like after it is dead. There is a massive bazaar type building right beside the masjid and it is utterly empty and fenced off. The windows have not been finished and the wiring is exposed in many places. It doesn’t look like there is any intention of finishing it and it seems as if it will get worse. I see this happening here also and it worries me. Building for expansion is okay but building to keep an economy going, when the majority of people can’t even afford to live there, is a house of cards. I see this house of cards starting to get wobbly and I’m worried. Not only for Malaysia, but for the rest of the world as when one card falls, it starts knocking down the others until they are all flat on the ground.